We all have them. We have them hidden – out of sight – out of mind – but they still exist – our photos, and boy are they a mess! When you are ready – Leave A Legacy is ready to help you get started. Below are steps to follow to get them organized? 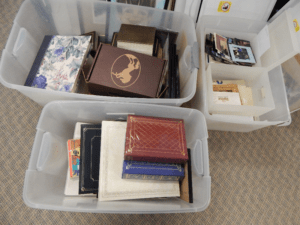 Make stacks or piles of each decade: 1960s, 1970s, 1980s, 1990s, 2000s, etc. Now organize within a decade, by year. For instance take your stack of 2000s and sort them into stacks of 2001, 2002, 2003, etc. We recommend that you organize all years within all decades before moving on to further organizing. Finally, you can organize within a year. We encourage you to not get hung up trying to figure out specific dates. Fifty or 100 years from now no one will care whether it occurred on April 1 or May 1 – just place the photos between Easter and the 4th of July. Or check out this video about organizing your memories.